Starting at the top, wash contaminants down and off the area. If parts are extremely contaminated, repeat application. Note: Use extension straw for precision application. Do not apply while equipment is running. Do not apply to hot surfaces. Test on small area before using on rubber, painted or plastic surfaces. Wipe off overspray. 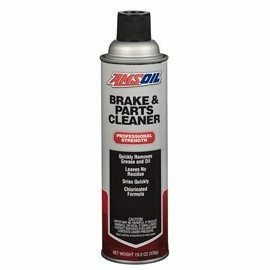 AMSOIL Brake & Parts Cleaner is available in 19-ounce spray cans. Not available in California, New Jersey or Canada. This product is not expected to cause health concerns when used for the intended applications and according to the recommendations in the Safety Data Sheet (SDS). An SDS is available online at www amsoil.com or upon request at (715) 392-7101. Keep Out of Reach of Children. Recycle used fluid and bottle.